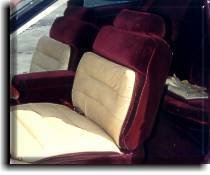 These are a couple of examples of some of the more unique request that Catalina Custom has had over the years and took that extra step to work with the customer to have a finished product that met the customers desires while at the same time having a interesting challenge that makes doing auto upholstery a trade that can be a joy to work in. 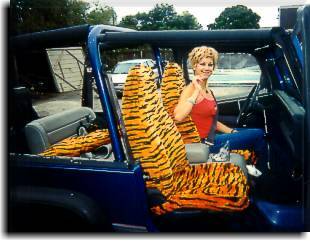 This young lady brought Catalina Custom a tiger striped cloth with a request to make some removable slip covers for her Jeep. After advising her of the possible consequences of using such a cloth exposed to the sun and elements (fading and moisture absorption) she still still wanted this product in her vehicle. As can be seen this was a job that met her desires and it was a lot of fun constructing such a colorful, neat looking job. This job presented Catalina Custom a special challenge that had a very rewarding feeling of accomplishment at the conclusion. 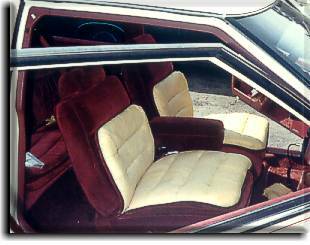 This elderly gentleman brought Catalina Custom his new Buick Riviera along with his six tanned deer hides he had for quite a few years. After advising him of the softness of the skins and the possibility of premature wearing, he still had a desire to sit on his deer skins. 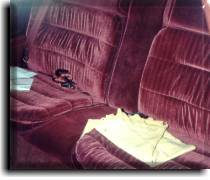 Catalina Custom took extra care and saved the original material inserts giving the customer the option of putting the seats back to their original condition if he so choose. 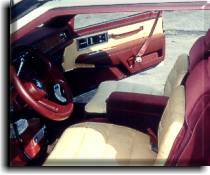 Catalina Custom then proceeded to replace the original cloth in the front seat pillow effect sections on the backrest and cushions. What made this job interesting was having to work around the bullet holes in the skins. With a lot of thought, material manipulation and careful effort, Catalina Custom was able to present the customer with a product that he enjoyed for quite a few years and a job that will be in the special memories of Catalina Custom (along with some left over deer skin samples) for a long, long time.